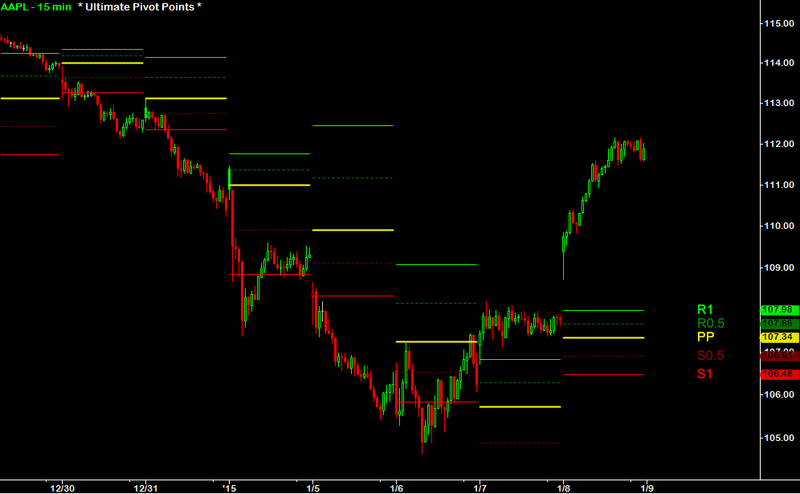 Are you limited by the Pivot Points you're using? The Ultimate Pivot Points™ (UPP) Indicator Package is the most advanced and extensive collection of “Pivot Points” Indicators available. 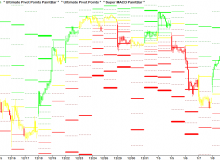 Though most traders are only familiar with the default “Floor Trader’s Pivots” found in most trading platforms, there are actually several other effective “Pivot Point” methods used for calculating support and resistance levels. The Ultimate Pivot Points™ Indicators include each and every “Pivot Point” method along with several innovative features — making it one of the most complete support & resistance (S/R) indicators available to traders. 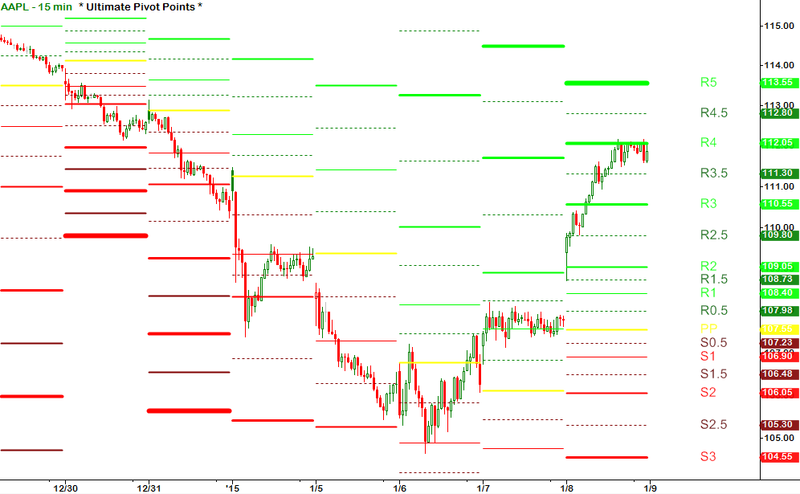 The Ultimate Pivot Points™ Indicator was initially created as an improvement upon the extremely popular and effective “Floor Trader’s Pivots”, which uses the previous day’s high, low and close to determine the key intra-day support and resistance levels for any symbol. Our goal was to develop a complete and all-encompassing solution for pivot point trading and have therefore added all of the pivot point methods and several advanced features. 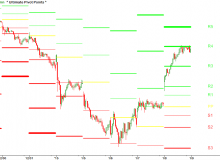 Floor Trader’s Pivot Points have been around for several decades and are considered to be the classic or traditional way of calculating support and resistance levels. 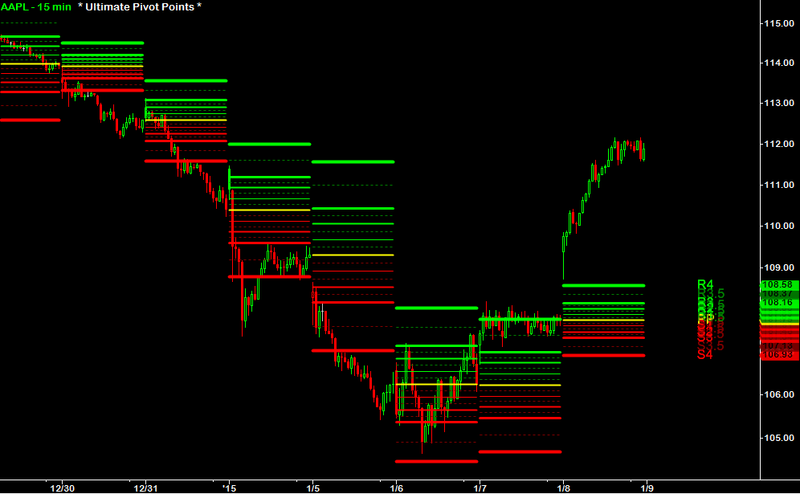 This method calculates the main pivot point (PP) level by averaging the previous period’s High, Low, and Close. The support and resistance levels are then calculated using the main pivot point (PP) level and the previous period’s high and low. 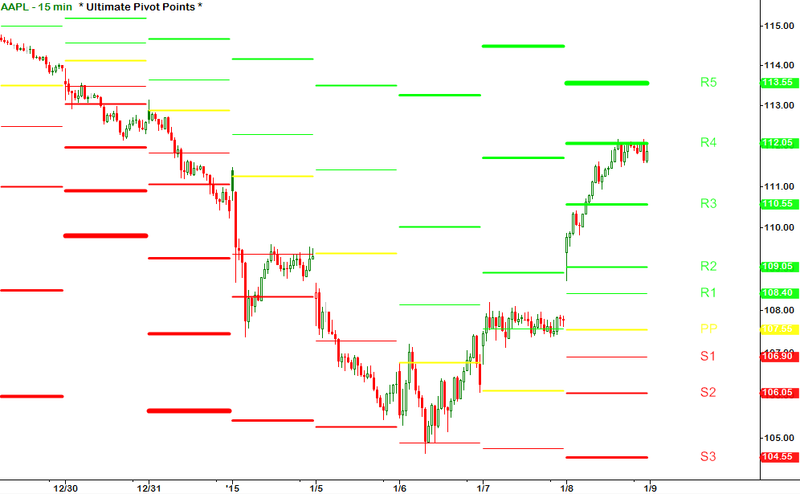 Floor Trader’s Pivot Points are still the most popular amongst traders and as a result, its support and resistance levels may have more predictive value than any other pivot point method. 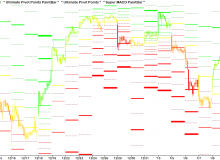 Woodie’s Pivot Points differs from the other methods by using the current session’s opening price to calculate the main pivot point (PP) level. The formula ignores the closing price of the previous period and instead applies more weight to the opening price of the current period. 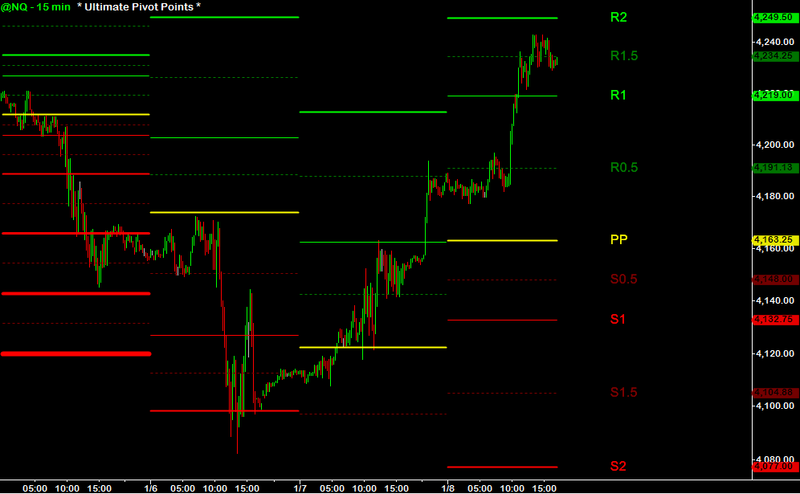 This gives the most recent price more emphasis when calculating the main pivot point (PP) level. 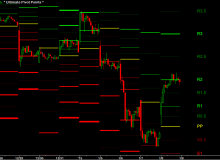 The support and resistance levels are calculated the same as the Floor Trader’s Method, however the levels differ since they are based on the main pivot point (PP) level. 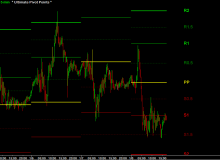 Camarilla Pivot Points were developed in 1989 by a successful bond trader known as Nick Stott. While the pivot point (PP) level is calculated using the same formula as the Floor Trader’s Pivots, the support and resistance levels are calculated differently — using the closing price and the trading range of the previous period. 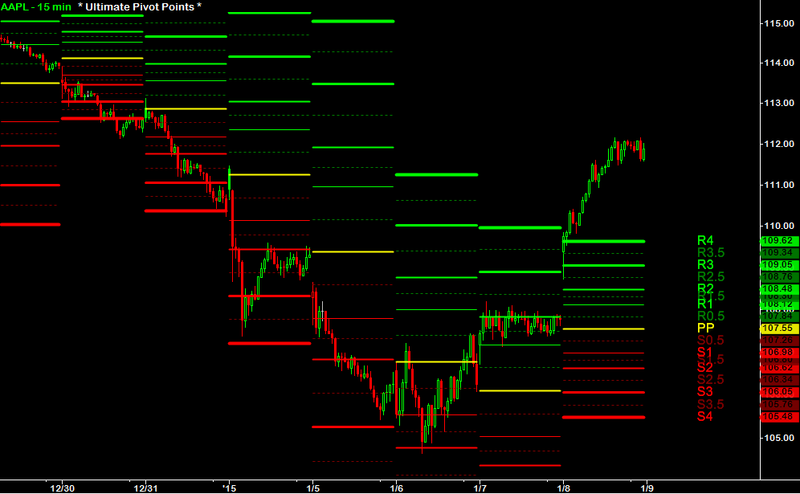 Unlike other pivot point methods, the Camarilla Method puts more emphasis on the 3rd and 4th levels of support and resistance (S3, S4, R3, R4). Typically, traders will look for price to stay within the S3 - R3 range throughout the duration of the session, while expecting price reversals to frequently occur at the S3 and R3 levels. 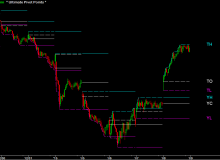 The S4 and R4 levels are intended to provide strong support and resistance, however if price moves beyond these levels it is often indicative of a strong breakout and price may move significantly higher or lower. 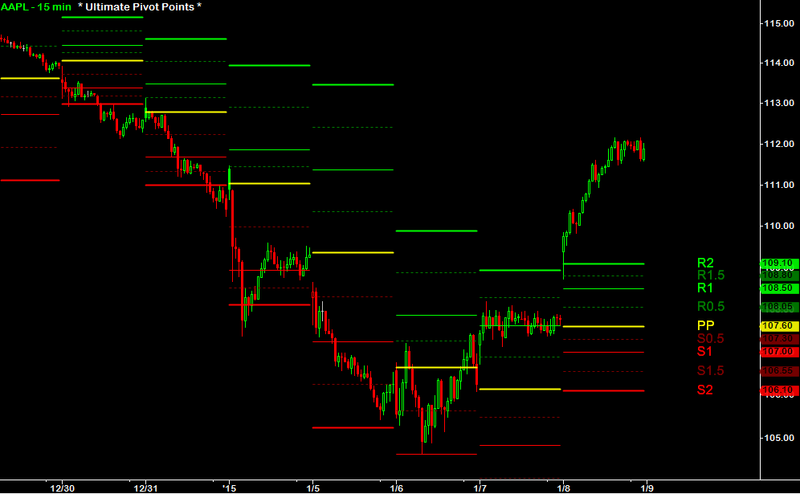 Demark Pivot Points are unique in that there is only one level of support/resistance, known as S1 and R1. 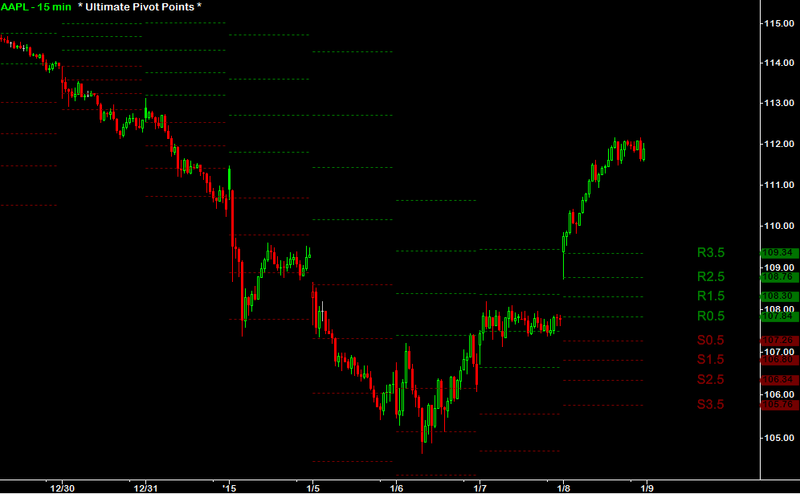 The main pivot point (PP) is not an official Demark value, but we have included it as a point of reference. When using Demark Pivot Points, the calculations for the S1 and R1 levels differ quite a bit from day to day, depending on whether the previous period’s close was higher, lower, or equal to the previous period’s open. 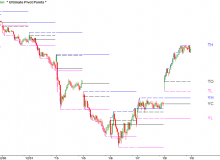 Fibonacci Pivot Points use the same formula as the Floor Trader’s Pivots to obtain the Pivot Point (PP) level, however the various support and resistance levels are calculated by using Fibonacci retracement and extension levels of the previous session’s trading range. 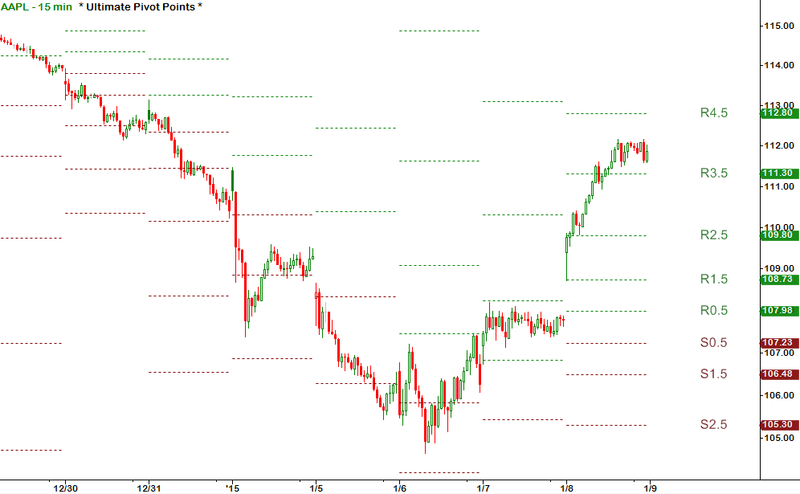 It should come as no surprise, but we at Fibozachi prefer to trade using the support and resistance levels of the Fibonacci Pivot Points. Since these levels are based on Fibonacci retracements and extensions of the previous day’s range, we believe that they have more predictive value than most of the other methods. Ultimate Pivot Points™ provides additional levels of S/R by calculating and plotting "half pivots": R0.5, R1.5, R2.5, R3.5, R4, R4.5, R5 and S0.5, S1.5, S2.5, S3.5, S4, S4.5, S5! Not only that, but it also gives the user the option of plotting both yesterday and today’s OHLC (open, high, low, close)! By adding the “half pivots” in addition to the opening and closing prices and the highest highs and lowest lows, we have increased the number of S/R levels from 7 to over 20! The reason this is so effective is because each day will have special “UPP™ Zones” where multiple bands of support or resistance cluster together at a certain key level. 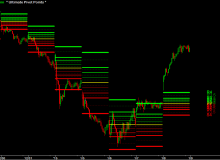 These “UPP™ Zones” often prove to be the strongest and most important levels of support and resistance during each trading session. As you can see in the image above, there was a clustering of R1 and Yesterday's High (YH), the PP and Yesterday's Close (YC), and also S1 and Yesterday's Low (YL). 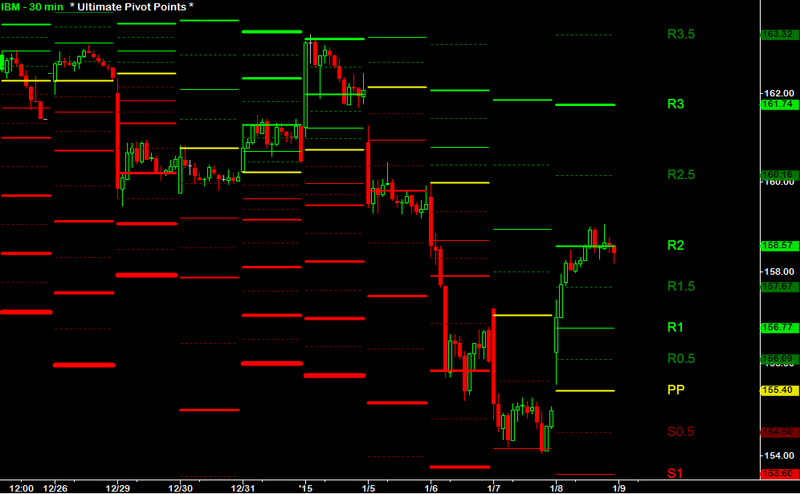 Sure enough, price repeatedly found both support and resistance at the UPP Zones! 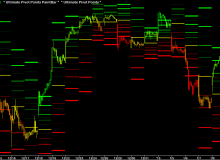 Ultimate Pivot Points™ also includes a special "Scanner" Indicator designed for the NinjaTrader Market Analyzer, TradeStation RadarScreen, or MultiCharts Market Scanner. It provides an overview of all support and resistance levels for any list of symbols — enabling you to properly manage your current positions, scan for symbols that are crossing above or below any of the various support & resistance levels, or just scan for symbols that are extremely oversold or overbought! 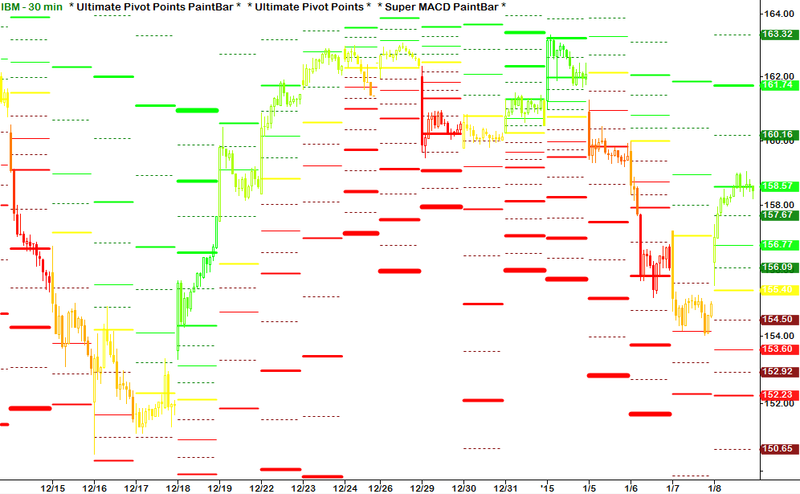 Have a question about the Ultimate Pivot Points™ Indicator Package? Check out the Ultimate Pivot Points™ User Guide to learn more! 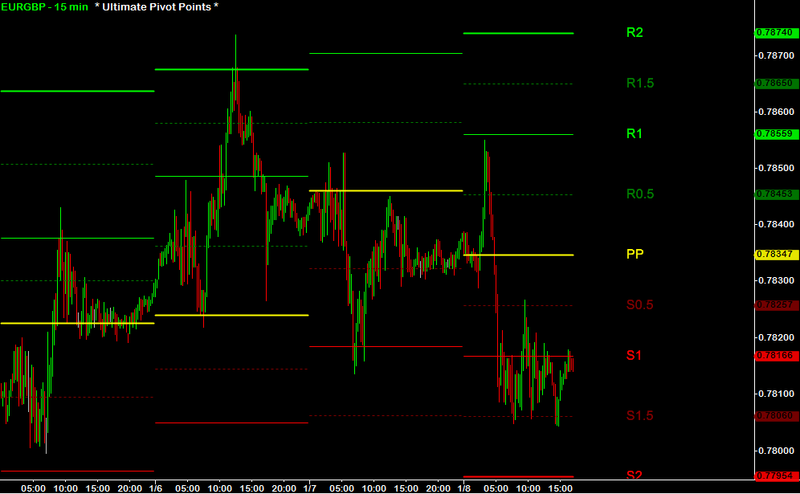 Your UPP Indicator is the all-in-one pivot and support/resistance indicator that I've been looking for. I hate having to stare at the screen all day, so having all the audio and pop-up alert boxes is exactly what I need to monitor crossovers of the support and resistance levels. 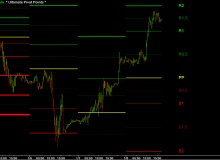 Thanks for a great indicator and for allowing me to have a lot more freedom during my trading day. I can actually get out of my chair now! 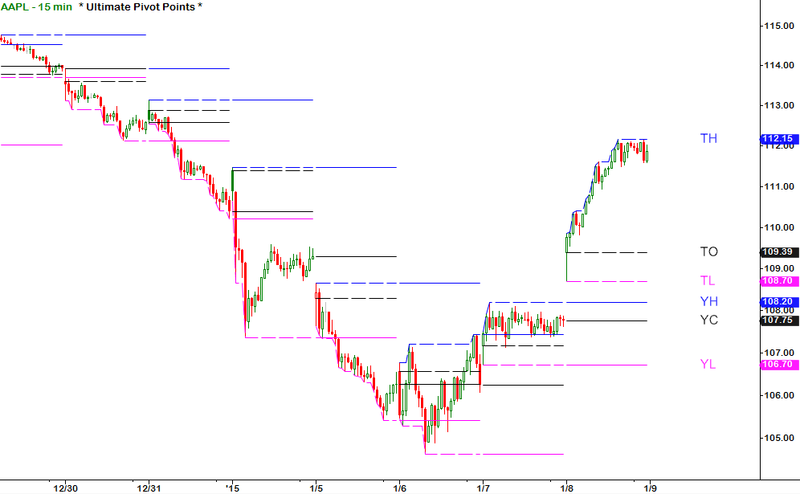 I’ve been plotting the Floor Trader’s and Fibonacci pivot levels on the same chart and it's much better than just using one type. Now I can see the price levels, where there are overlapping S/R levels and I know that those are really the key levels to note. 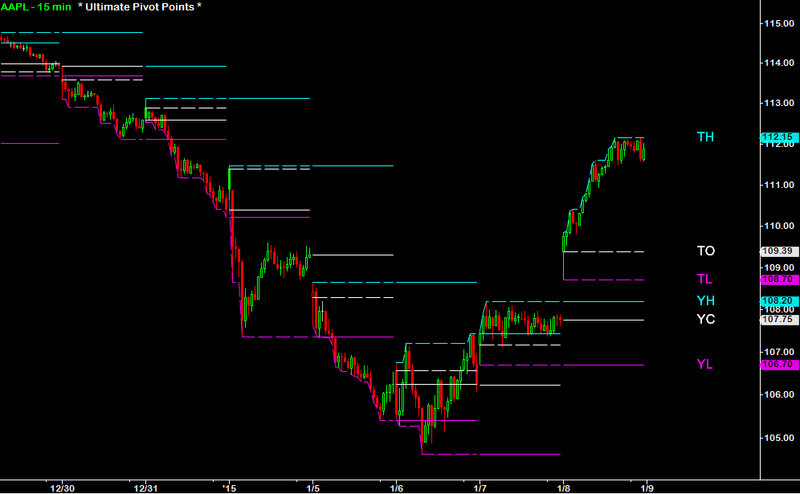 I've tried so many pivot point indicators out there and UPP is by far the most complete package. I’m one of those people who likes to customize everything to get it just right so I appreciate how flexible these input settings are. Loving all the options I have with the UPP indicators. All of the pivot methods have their own advantages so I’m still trying to figure out which pivot method works best…it’s definitely a good problem to have! 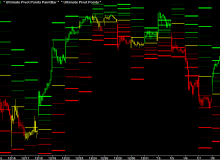 I’ve relied on Floor Trader’s pivots for more years than I can recall so it’s fantastic to see the UPP indicators add so many useful features to the classic version while preserving its effectiveness. 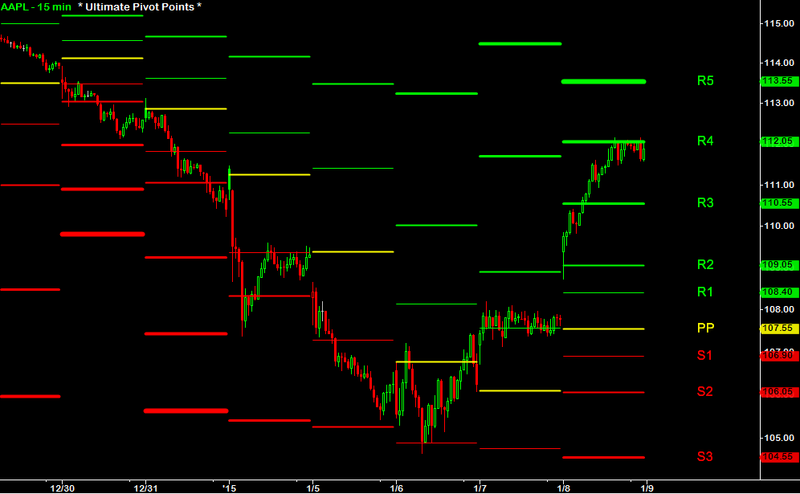 What is the most valuable feature of the Ultimate Pivot Points™ Indicators? - The UPP™ Indicators are undoubtedly the most comprehensive and customizable pivot point Indicators on the commercial market. 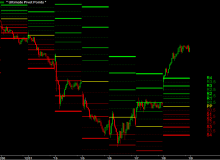 They contains numerous features that you won’t find in any other pivot point Indicator, especially the UPP™ PaintBar, which color-codes the price bars based on the distance from each level of support or resistance. 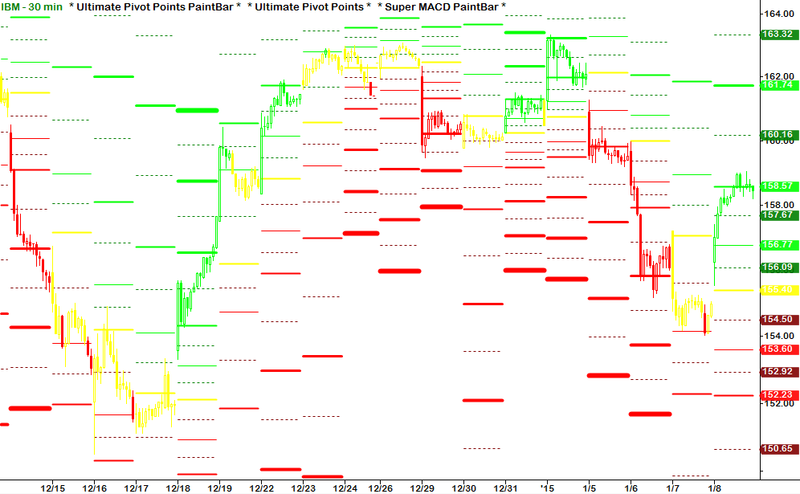 The UPP™ Indicators work on all timeframes and all chart types since the pivot point levels are calculated using the previous session's OHLC values. You can even choose if you'd like to reset the pivot point levels based on custom session times, as opposed to resetting when the date changes. How do I configure alerts for specific signals or conditions? The UPP™ Indicators include optional alerts for when price crosses above or below ANY of the support or resistance levels. How do I scan a list of symbols for specific signals or conditions? 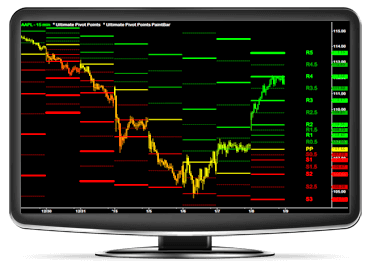 The UPP™ Indicator Package includes a specialized scanner Indicator that is designed to be used with the Market Analyzer (NinjaTrader), RadarScreen (TradeStation), or Market Scanner (MultiCharts). You'll also receive fully configured templates and workspaces so that you can begin scanning for signals and trend conditions immediately! How can I use the UPP™ Indicators within my own strategies and codes? The UPP™ Indicators can be used in your own custom strategies and Indicators by purchasing the “UPP™ User Functions”, which are sold separately for $95 (half the cost of the Indicator Package). * You must own the UPP™ Indicator Package to use the Functions since they reference the Indicators. 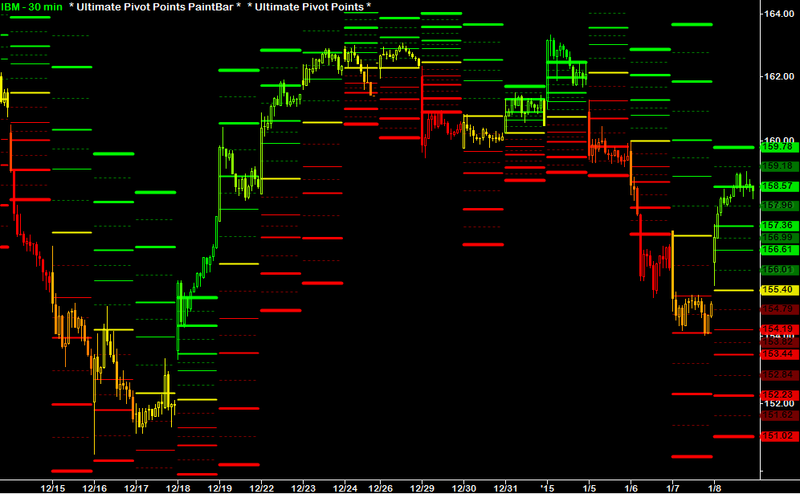 What other Indicators do you recommend using in combination with the UPP™ Indicators? The UPP™ Indicators are unique in that they are based on pivot point levels, which means there is no overlap and they can be combined with all other types of Indicators.